Aldingham castle is an unusual 13th century motte and bailey castle. The site is believed to have been first fortified in the 12th century as a ringwork and bailey structure. The ringwork was then filled in and the earthworks heightened in order that a motte could be raised and a wide ditch created. Above. 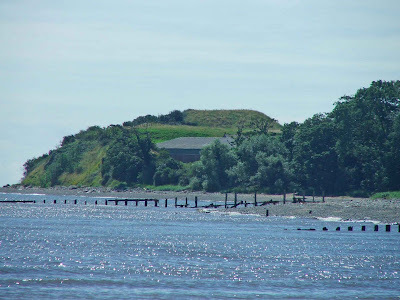 A view of the motte looking South from the beach. The remains now sit precariously on the cliffs over looking the sea, with erosion being a problem on the east side of the motte. Above. A view of the motte looking East out towards Morecambe Bay. 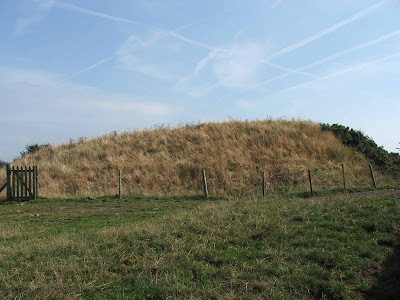 The motte is around 30 feet high, with a ditch surrounding it to a depth of around 10 feet. The ditch varies in width from 15 to 20 feet across. The above two photos show the view of the castle from the beach. This area can be accessed from the footpath that runs from the graveyard of St Cuthberts church about two miles down the coast walk.The remains site to the east of the A5087, South of Bardsea and about 6 miles south of Ulverston, on the Cumbria coastal walk. 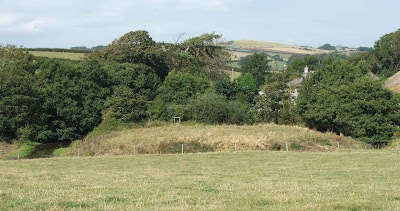 Although the remains are on private land, and fenced off, the motte can be seen clearly from the adjacent field. Just watch the cows…..they’re a little edgy when people stray from the path!! Above. Another view of the motte looking East. About 150 yards to the West of the motte and bailey remains, and across some unidentified earthwork ditches (possibly the remains of the bailey defences), lays the remains of Aldingham Grange, the supposed remains of a 12th century manor house. All that remains of this site however, is the water filled moat and the earthen mound in the centre. Above. The moated platform of Aldingham Grange, looking North. It is thought that this was the site of the manor held by Michael de Fleming. There are not traces of stone work on the mound in the centre of the moat, possibly indicating that a timber structure was erected here. Above. A view of the moat surrounding the central earthwork. This is alleged to have been the site of the manor belonging to the Le Flemings.